In September Apple informed the developer community that a cleanup is conducted to evaluate the existing apps on iOS App Store and remove those that “no longer function as intended, don’t follow current review guidelines, or are outdated”. 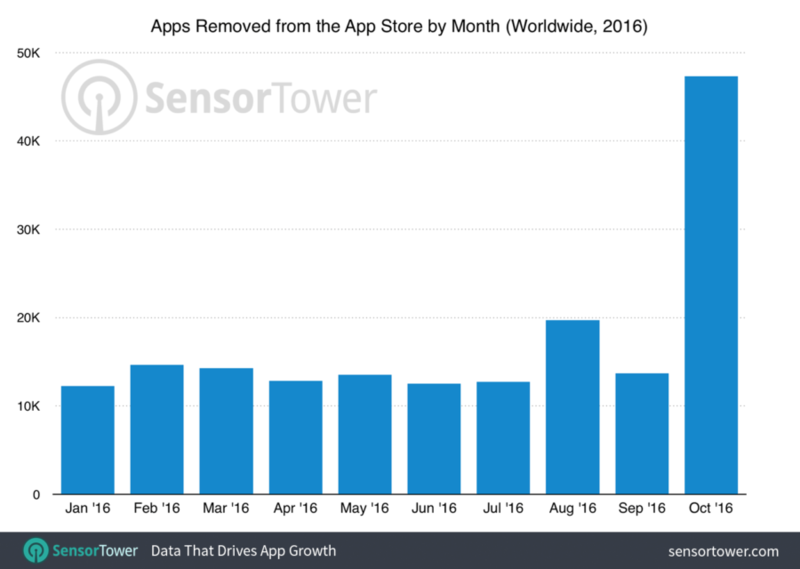 Now Apple appears to be fulfilling that promise with increasing app removals, according to new data from Sensor Tower shared by TechCruch. The 3rd party research company found that 47,300 apps were removed on Apps Store in October, a 238% increase versus the previous month and about 3.4 times more than the average month. As calculated, averagely 14,00 apps are removed from January to September. The new removal of nearly 50,000 apps shows Apple’s determination to clean up useless apps that clutter the App Store. Among the total 47,300 apps, mobile games stand in the breach in current app categories. As the most popular soft category on the Apps Store, the Games apps take around 28 % of the removed apps last month. The followings are Entertainment (8.99%), Books (8.99%), Education ( 7%) and Lifestyle (6%). Apple said the App Store purge started with the problematic and abandoned apps that don’t work at all or are never downloaded since the launch. Notices will be sent to developers whose apps have not been updated for a long time, or no longer function as advertised. Apple also specifies that the names for new app and updates submitted for approval are now limited to no longer than 50 characters. If an updated version is not submitted for review within 30 days, or it still fails to meet the current review guidelines, the app will be removed from the store. The users downloading an app before its removal will still be able to enjoy the service and buy in-app purchases. Apps with spammy names or crashing on launch will be removed immediately.